The evolution of the immune system in terrestrial vertebrates has allowed a high efficiency in the protection against mutated and cancer cells, foreign substances and microbes. Immune cells however become fully immunocompetent only late during development or in early life. This process determines some problems in the immune recognition of early antigens, the chemical determinants of immunity formed in the embryo before immune cells become mature. Recent studies point out that mature immune cells are likely intolerant to early antigens and tend to eliminate embryonic-like cells of the same individual produced after wounding. This is indicated in the study of limb and tail regeneration in frog tadpoles as they progress toward metamorphosis to become fully terrestrial frogs. During early tadpole stages many tissues and organs, including the nerve system and limbs, can efficiently regenerate but this capability is gradually lost as tadpoles progress toward metamorphosis, the process that turns tadpoles into froglets (Fig. 1 A). Aside other physiological and anatomical changes, the immune system becomes more efficient and likely can no longer tolerate embryonic-larval antigens. 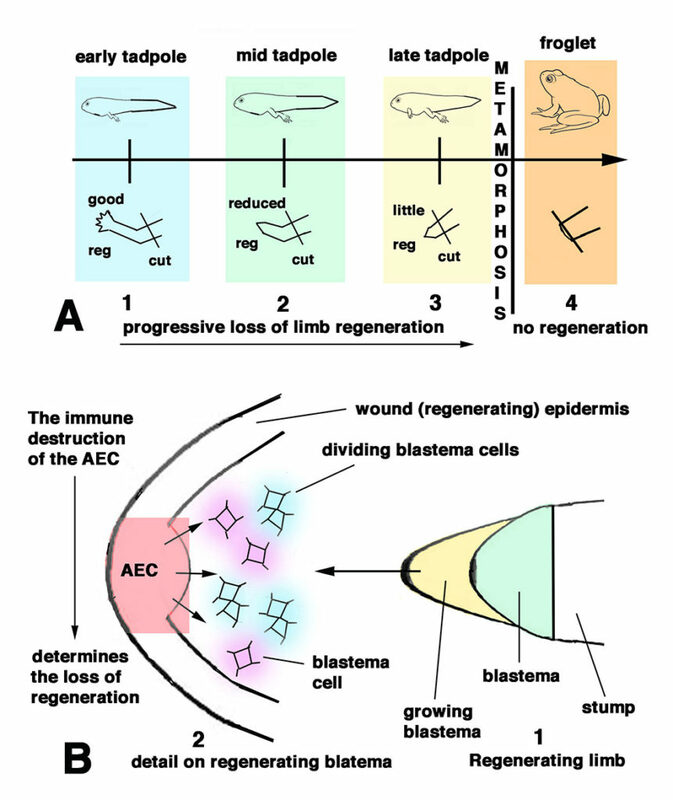 The latter are formed in mesenchymal and epidermal cells after limb amputation, in a process necessary to form a regenerative blastema, the outgrowth from which a new limb is regenerated after cut (Fig. 1 A1,2,3). The regenerating epidermis forms an “Apical Epidermal Cap” (AEC), a group of epidermal cells located at the tip of the blastema that maintains the growth of the regenerating limb through the stimulation of mesenchymal cell proliferation (indicated as 3 small arrows in Fig. 1 B). The explanation of this loss of regeneration approaching metamorphosis has remained speculative, but recent studies pointed out the change of activity of the immune system as the main cause. In fact, a recent microscopic study has detected an increment of the number of immune cells after limb amputation in older tadpoles with developed fore- and hind-limbs (Fig. 1). The study under light and electron microscopes has followed the localization of macrophages and lymphocytes, the effector cells of the immune response, in the tissues of the amputated limb in young and older tadpoles of Rana dalmatina. While few immune cells were seen in the regenerating limb of young tadpoles (with small hind-limbs and no forelimbs, Fig. 1 A), immune cells increased in these tissues at later stages preceding metamorphosis, in tadpoles with well developed hind- and fore-limbs (Fig. 1 A, 2 A, B arrows on dark cells). Immune cells penetrate into the apical epidermis of the blastema, and determine the destruction of the cells forming the AEC (Fig. 2 B arrows, C, D asterisks show degenerating areas among epidermal cells). The consequence is that without AEC no limb regeneration can now occur, in part explaining also the failure of limb regeneration elicited in adult limbs of frogs (Fig. 1A, 4). 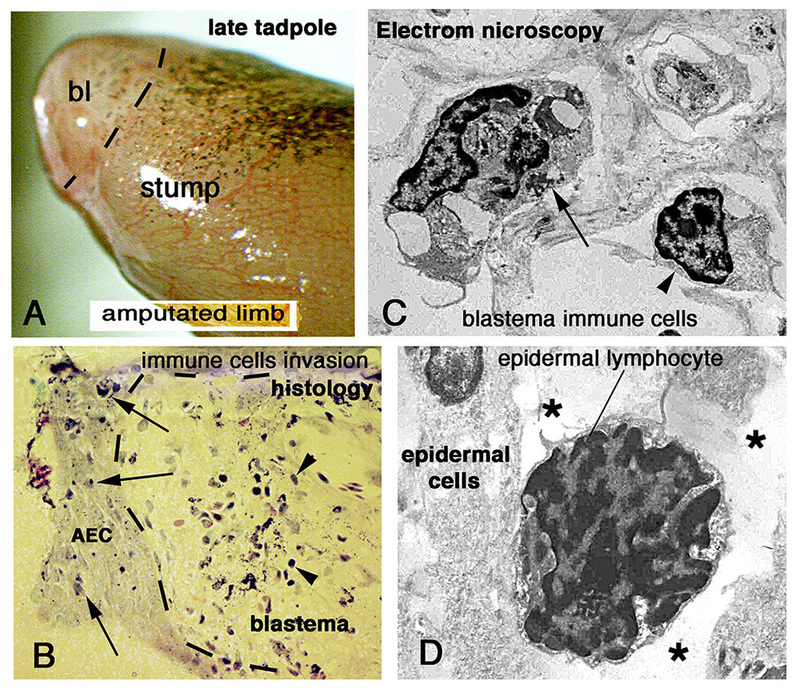 The invasion of the regenerating apical epidermis is also detected in the limb blastema of fully terrestrial vertebrates such as lizards, further indicating the negative influence of immune cells for organ regeneration in vertebrates. These studies have further pointed-out that an efficient immune system shows an anti-regenerative activity in terrestrial vertebrates, including humans. Attempts to overcome the deleterious action of the immune system on organ regeneration in vertebrates must therefore include the use of immuno-suppressive molecules, and recent studies point to hyaluronate as one of the main naturally occuring molecules protecting blastema cells from immune cells. Microscopic observations show invasion of inflammatory cells in the limb blastema and epidermis in pre-metamorphic frog tadpoles which destroy the Apical Epidermal CAP and impede regeneration. Inflammation and immunity in organ regeneration. Regeneration or scarring: an immunologic perspective.